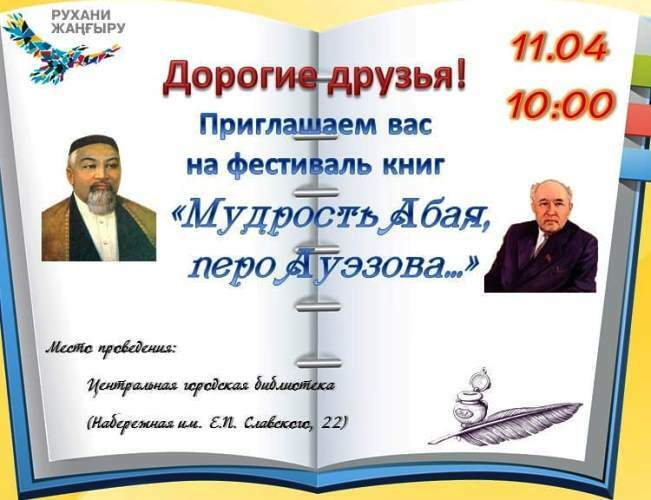 On April 11, 2018 at 10-00 in the framework of realization of the program article «Болашаққа бағдар: Рухани жаңғыру» in the literary room of the Central city library (22, Irtysh Embankment named after Slavsky) the festival of book «The wisdom of Abay, the pen of Auezov...» will be held. In the program of the event: excursion for the guests, book review on the theme of the festival, the review of children's exhibition of books-anniversaries «Treasures of the book world», literary contest on the knowledge of «Words of edification», first published 120 years ago, but not losing it's relevance nowadays. The purpose of the festival: through acquaintance with the great heritage of the great Abay, M.Auezov, Shakarim, through promotion of the spiritual heritage to awaken the conscience of young generation, to educate the need to serve our nation, to bring purity and sanctity of national heritage as the personification of national spirit. The library doors are opened for everyone who wants to visit our festival.